Argyll is a place in Scotland famous for its golf courses. 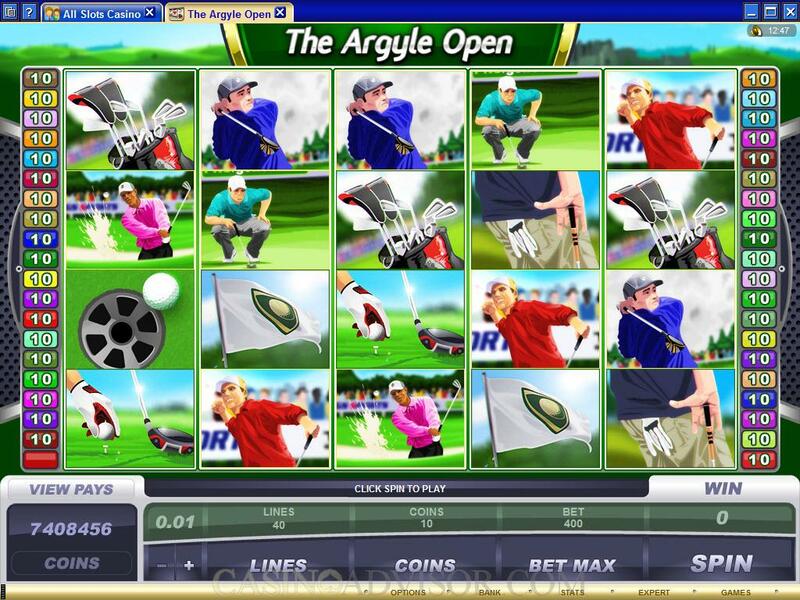 The Argyle Open from Microgaming takes up this concept and creates a golf themed slot game. 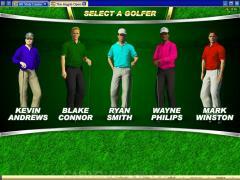 The introductory clip says that the Argyle Open is one of the most prestigious events featuring the top golfers. 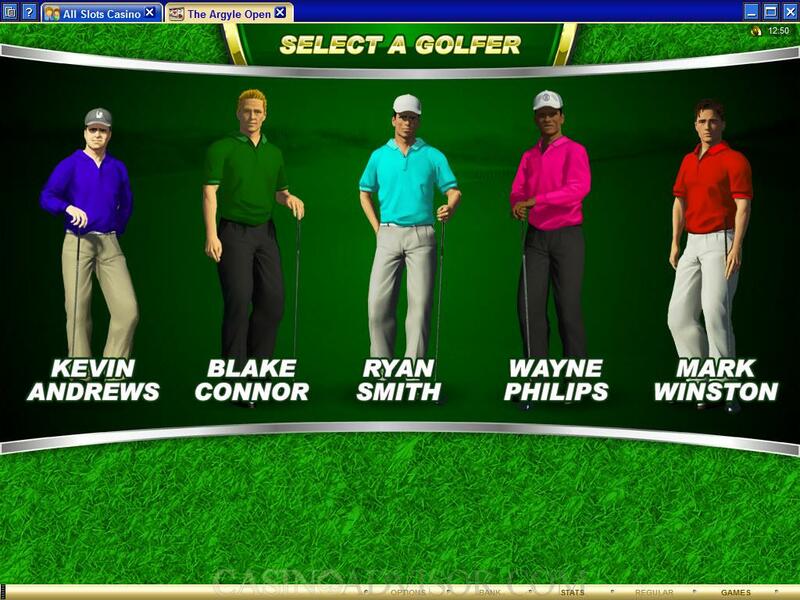 These golfers are Wayne Philips, Ryan Smith, Mark Winston, Blake Connor and Kevin Andrews. They can be seen as symbols on the reels performing regular golfing activities. For example Philips is digging the ball out of the sand trap and Connor is holding the trophy aloft. The other symbols are also associated with golf and are Glove, Tee, Boot, Clubs and Flag. The Argyle Open Logo is the wild symbol and the Ball is the scatter symbol. All symbols have been realistically crafted and help create the atmosphere of a major golf event. The Argyle Open has four rows of symbols on each reel. It is a 40 payline slot game. The players can wager up to 10 coins per payline. These offer flexibility to the betting options. However the overall betting range gets restricted by the selection in the coin size. The coins are available only in denominations of 0.01, 0.02 and 0.05.Therefore the maximum line bet is 0.50 and the maximum total bet per spin is 20.00. These limits would keep high rollers away. The Argyle Open Logo is the wild symbol and substitutes for all symbols except the scatter symbol. It does not multiply payouts but appears stacked on the reels, sometimes in stacks of four. Hence it usually provides multiple paying combinations in each spin. Also five wild symbols in any active payline offer the highest fixed jackpot of 1000 coins. The Ball is the scatter symbol. It offers scatter payouts when two or more of the symbols appear anywhere on the reels. The Ball symbol also triggers the bonus round when three or more symbols appear anywhere on the reels. The bonus round called the Tournament Bonus completes the hole in three competitive stages. When the bonus round is triggered for the first time the player is taken to Stage 1, which is the tee off stage. The further you tee off the larger is the bonus payout. This is randomly controlled and does not require any skill. After Stage 1 players return to the main game. When the bonus round is triggered the second time players are taken to Stage 2. In Stage 2 the further the ball is hit down the fairway the larger is the bonus payout. Stage 3 takes players to the putting green. The closer the ball is chipped to the hole the more are the free spins awarded. The maximum number of free spins is 20 with a multiplier of up to 5x. The free spins can be re-triggered at the original number and multiplier. Interested in reading more detailed information about The Argyle Open? If so Click Here for more details.